Do you know what comes up when you Google the word “metropolis?” Go ahead, take a second and do that. The first search item that came up for me was the 1927 German science-fiction film Metropolis. I won’t bore you with a summary, though if you’re a big movie buff you should probably watch it. The main thing you need to know is that the movie Metropolis is set in the future, in the year 2026 (a much more distant future then), in a dystopian world. Now, I’m pretty sure Duncan didn’t name this yoyo after this old film. But, being that the classic film in placed in the distant future, I must ask: Is this the beginning of the future for Duncan? I believe it is. 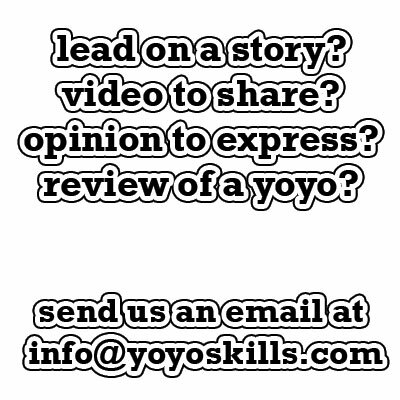 Duncan is well known, even to non-yoyoers, as the company who gave us the imperial and the butterfly. Duncan is now showing us what they have to offer for the modern thrower. They’re stepping up their game, offering modern throwers what they are demanding, things like C size bearings and recessed response systems that can take flowable silicone if desired. Duncan, as usual, is also doing all this at an affordable price point. 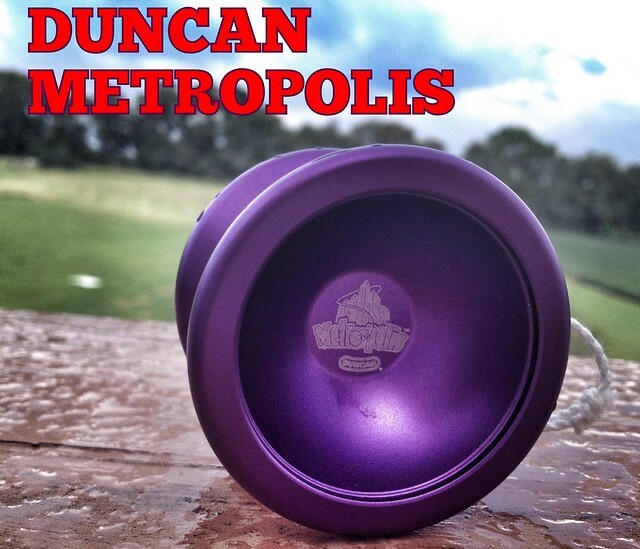 So let’s test the Metropolis and see what Duncan has made for us, the modern thrower! The Metropolis comes in one of those I-need-the-jaws-of-life-to-get-this-package-open sort of packages. You know the type. The kind that you almost always cut yourself from the sharp edged plastic. This I wish Duncan would change. I realize these are meant to be priced at a reasonable price point, so beefing up the packaging may increase the sticker price. But at least have one of those sealed ones with the backing that punches out with ease. After finally getting the yoyo out of it’s packaging, what emerged was a nice shade of purple yoyo with a unique and odd shape. Nice bright colors on this line. I like the simple one tone color. 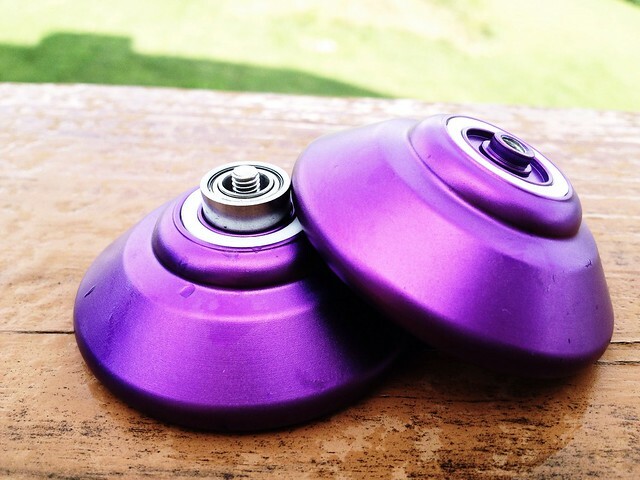 I realize it’s also the cheapest way to produce this yoyo, but it’s also refreshing to see some simplicity amongst the many crazy ano patterns that are out there today. Nice finish, too, one that will be decent on grinds I’m sure. Each side of the Metropolis is engraved, one side with the standard Duncan logo and the other with a Metropolis logo (as can be seen in the photos). The shape is interesting. It’s mostly a v-shape, but then it has the interesting rounded step at the gap. Overall, the shape looks like it’d be pretty comfortable in the hand. On the first throw, right out of the box, the Metropolis played quite well. But I soon caught a little bit of vibe on the string, but nothing too horrible, and certainly nothing that affects play. However, on a simple arm grind, the vibe was predictably more intense. The finish was great for grinds, but the vibe certainly slows the Metropolis down quite a bit. That said, grinds aren’t impossible with the Metropolis. There really isn’t an IRG, so thumb grinds and the like are really out of the question (especially for some one like me who has gorilla thumbs). The weight of the Metropolis feels pretty center weighted, which is probably do to that giant rounded step at the catch zone. This isn’t horrible, but it certainly doesn’t make the Metropolis feel floaty. I think the step was a good idea, but it needed to be made smaller and a little more weight needed to be added to the rims, for longer spin times, greater balance, and more float. The Metropolis doesn’t have crazy spin times, but it’ll do the job for those longer tricks and combos, and it would be a great throw for anyone adventuring into more advanced play. I feel the Metropolis is a great new step for Duncan, with it being all metal and standardized c-bearing and response. And what’s not to like about the price? There are some things that I’ve hit on that I believe could of been better executed. The packaging could be nicer and easier to open. There was some decent vibe, which honestly is probably hit or miss. Some Metropolis’ may be much smoother, while this one had a decent vibe. I also feel the shape, especially concerning that awkward step, could have been adjusted. Overall, the Metropolis is a fun throw! The Metropolis is really for everyone! If you’re a beginner or this is your first metal, and not looking to spend over $100, then the Metropolis is for you! If you’re an advanced player, and not looking to spend over $100, then the Metropolis is for you! What am I saying? Go buy a Metropolis, whoever you are! Did you have a problem with this model eating strings? I stopped using mine after it went through 4 strings in 10 minutes, then a serious rubdown of the bearing seat area, and it was still eating strings. Mine went back on a RA to Duncan. I do hope to get it back soon. When I did play it, I liked it, but the string eating was just too much of a problem. Thanks for the compliment! I appreciate the support and encouragement! I dig your review. It has quality that you don’t always see. keep it up! Auto correct is not awesome some times. Are you saying you wish for a PSG review?